Our Renewal Fee is $250 for each lease that we renew for a term of 6 months or greater. We charge $125 for any lease renewal less than 6 months. Most Property Management companies charge a renewal fee. Some charge a flat rate like we do, while others will charge a percentage of rent. During the renewal, you will receive a free walk-thru of the home along with an associated report with photos. We will also conduct a free Comparative Market Analysis of your home to ensure you are getting the optimal rent rate. • We will conduct a site visit of the home. During this visit, we will complete a report on the property and provide that report to you along with photos. If there are lease violations, such as an unauthorized pet, for example, we will be sure to remedy those immediately. If everything checks out, we will suggest renewing the Tenant. • We will also conduct a new comparative market analysis to determine if the rent amount currently being charged can be raised. Our goal is to maximize your rent and we will provide you the most current market data. • We will then negotiate the rent terms with the Tenant on your behalf. • Finally, we send out a new lease for signature. 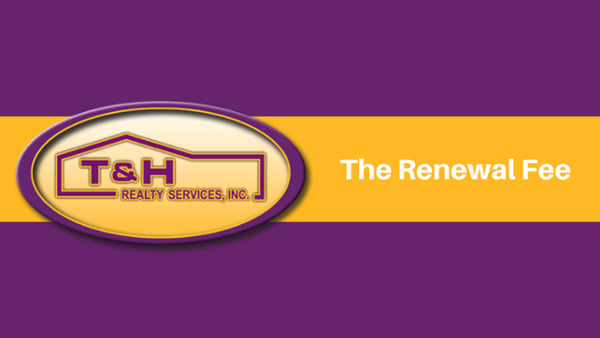 We love renewals at T&H Realty Services. In fact, we provide year-end bonuses to our employees based on our renewal numbers. As a result, we experience a very high renewal rate for our industry, which obviously translates into higher returns for our Owners. If you have any questions about our renewal fee, please don’t hesitate to contact us.